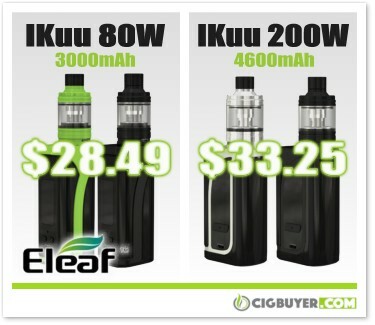 We just spotted a couple great clearance deals at 101 Vape – the Eleaf iKuu i80 Starter Kit for just $28.49 – and the Eleaf iKuu i200 Kit for only $33.25. Awesome pricing! Both kits are firmware upgradeable and include battery and tank. The Eleaf iKuu i80 offers up to 80W of output and features a 3000mAh battery with temperature control (Ni/Ti/SS), TCR, ramp-up and bypass. The Eleaf iKuu i200 has all of the same features but boasts a larger 4600mAh battery and offers up to 200W of output. Both kits include the 4.5ml Eleaf Melo 4 Sub-Ohm Tank and come with two coils (0.3 and 0.5 ohm).